As their sea ice habitat shrinks from climate change, skinnier and hungrier polar bears face a grave challenge to their survival. How does climate change affect polar bears so dramatically? Polar bears rely on sea ice to access the seals that are their primary source of food as well as to rest and breed. 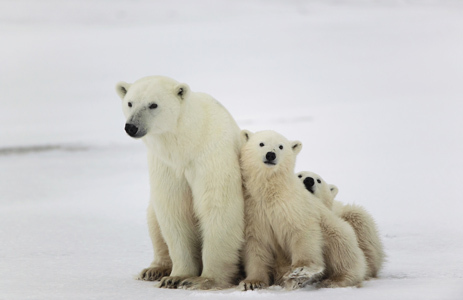 With less sea ice every year, polar bears and many other ice-dependent creatures are at risk. Your support for our global conservation efforts has never been more important. 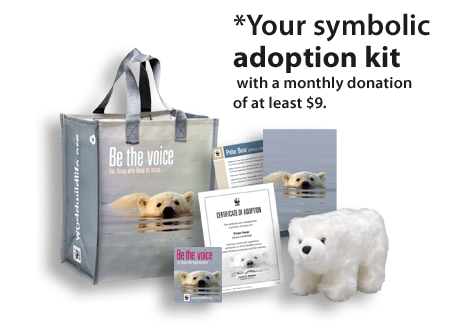 You can play a critical role in the fight to protect wildlife and their habitats by symbolically adopting a polar bear. Please donate monthly to help WWF protect wildlife and wild places around the world. No Premium I prefer not to receive a gift, maximizing my support of WWF's global conservation efforts. Making a donation of at least $9 entitles you to a free gift. Your donation supports WWF’s global conservation efforts.